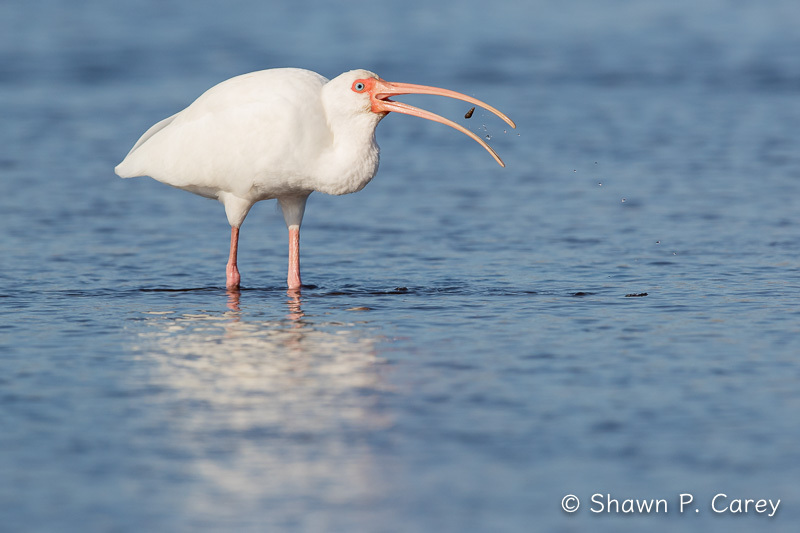 Wildlife photographers throughout the United States enjoy spending time in Florida and I am no exception. I have been going to the Gulf Coast of Florida now for over 30 years and in the Sarasota area my absolute favorite location is Myakka River State Park. 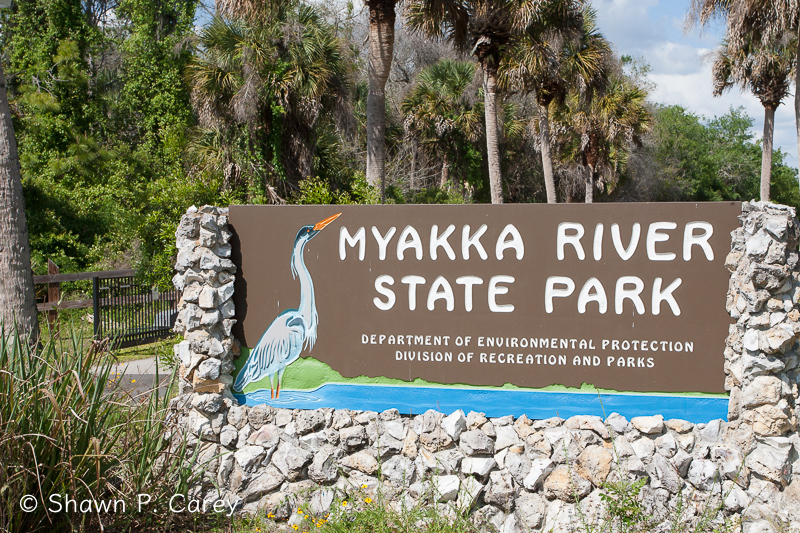 Located just off I75 on SR 772 Myakka RSP is possible the best state park in all of Florida. At least in my opinion. Covering 37,000 acres with two lakes, the Upper Myakka and Lower Myakka and the Myakka River flowing through it there are plenty of birds and other wildlife to view and photograph. 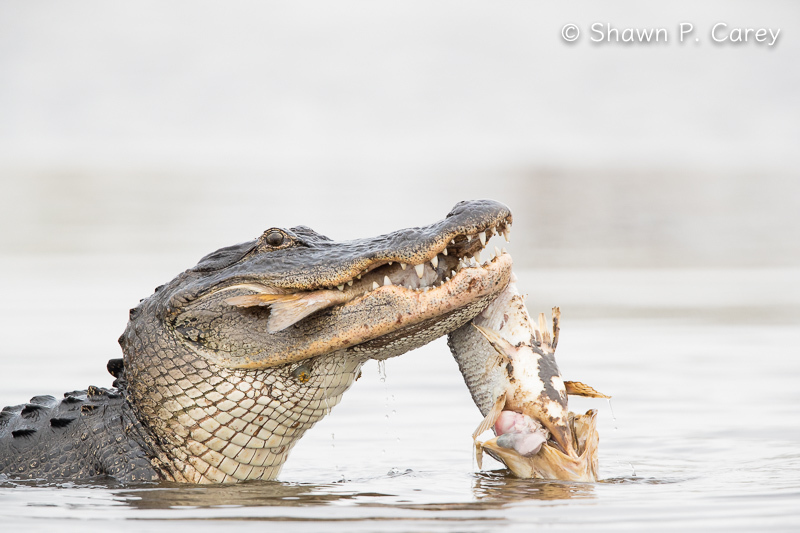 American alligator. Click the photo above to view a video of this alligator. One of the things I’ve enjoyed over the past 20+ years is taking part in the annual Christmas Bird Count (CBC) at Myakka RSP. Having done this for many years I have had a chance to see areas of the park that most people never visit, both on foot and by truck. With Myakka RSP being so large there are several teams of people that fan out to cover the entire park on the third Monday of December each year for the CBC. For three years running I was part of the group that drove off the main road heading east on the Power Line Road to the very end of the park. If you look on Google earth you can see the 2.6 mile road (over 5 miles round trip) which does not allow vehicles, hiking only. It’s the only place in the park I’ve seen panther tracks. By taking part in the CBC is has also allowed me over the years to meet several park employees, volunteers and other bird watching enthusiast from all over the United States. Some of which I have become friends and always look forward to seeing each year when I return. On my first CBC at Myakka RSP I met at the time one of the parks lead biologists and park ranger Paula Benshoff. She has since retired however in 2002 wrote a book about the park titled Myakka. If you have an interest in knowing more about the history and other details of Myakka RSP this book is a MUST read! 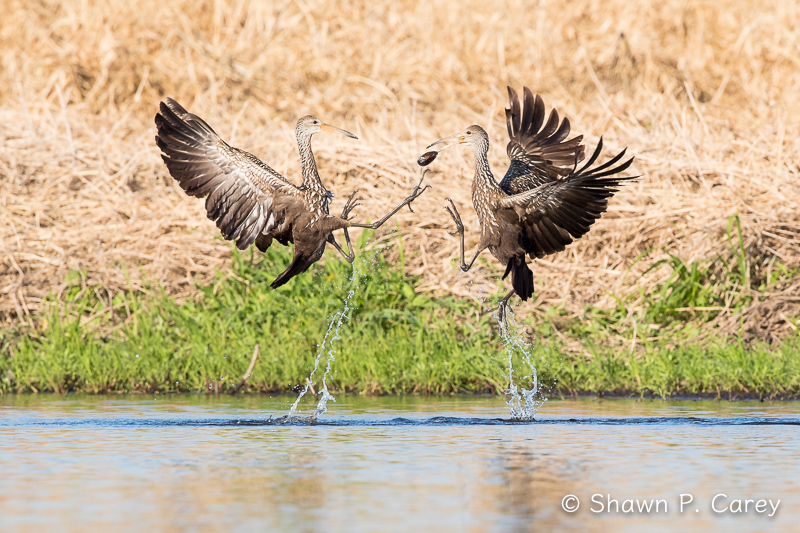 Limpkins. 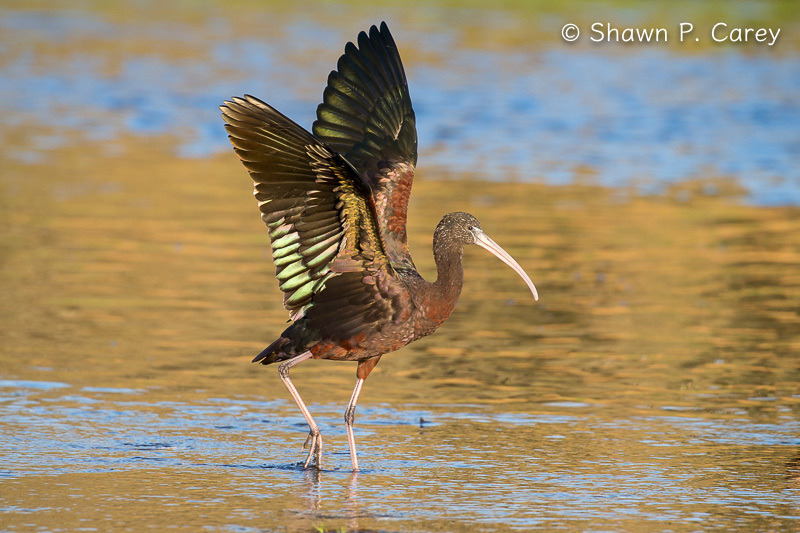 Click the photo above to see a video of Limpkins and other birds near the weir. 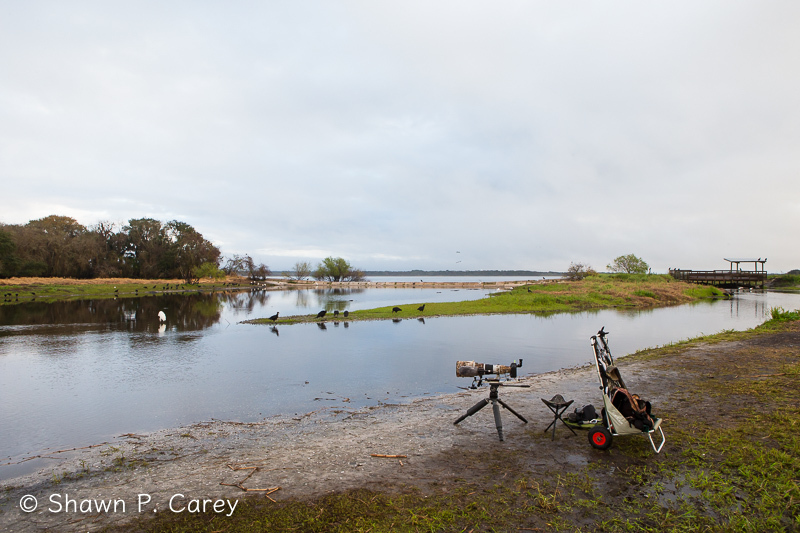 As for photographing at the park there are a few locations I’ve found to be the best for birds and alligators. First and my favorite is the area near the weir. This is located just past the large parking lot at the end of the road on your left (west) as you face the lake. Walk along the shore or through the woods towards the weir and the old platform which is now closed and in need of repair. From the parking lot this will take all of two minutes. 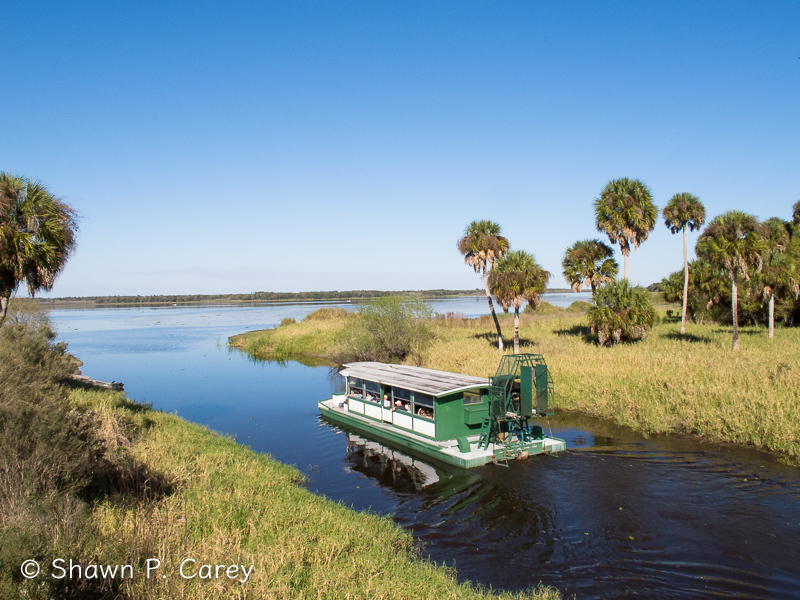 Once you arrive you are looking at the Myakka River. If the water level is not to high or even low this is best for wadding birds, shorebirds and good viewing of alligators. The photo below shows spot where I like to set up for any morning shoot. I’ve spent many hours at this very location and over the years I’ve captured some amazing photos and videos. 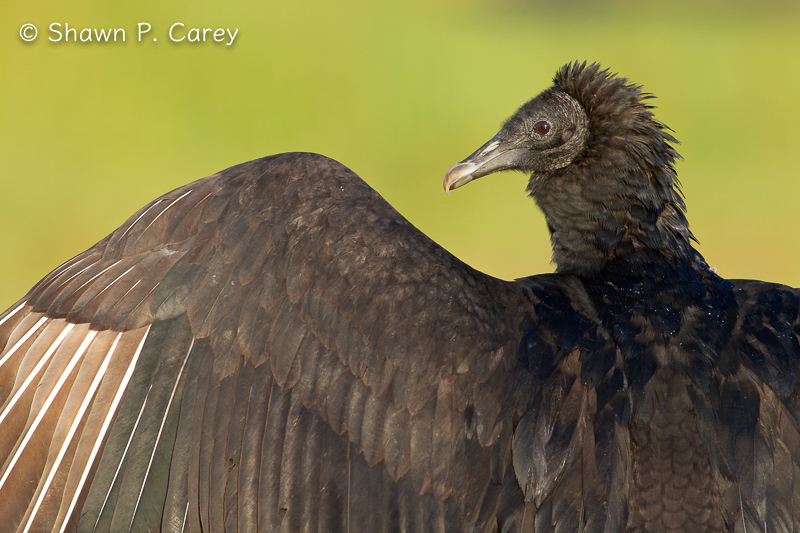 All long-legged wadding birds found in Florida are possible here except Reddish Egret. The trade off for Reddish Egret is there are more Limpkins’ in this area then you can possible image. For the CBC last year just from the area around the weir we counted over 110 Limpkins. The following week I was there almost every morning and my high count was 130! If you want to see and photograph Limpkins this is THE SPOT! 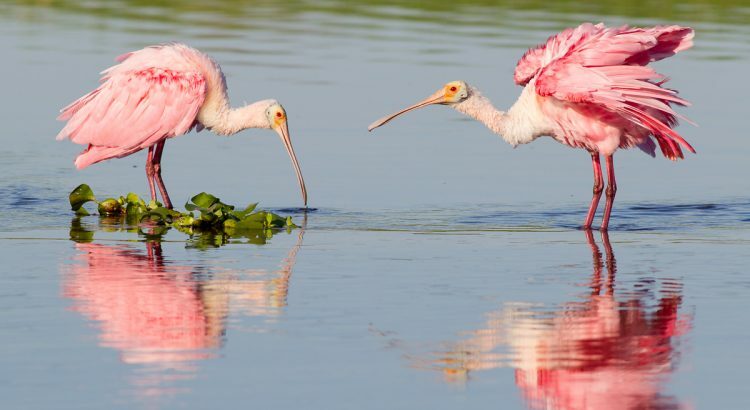 Plus in the winter months it can be very good for Roseate Spoonbill, Tri-colored Heron and Wood Stork. Other birds near the weir or along the shore line of the Upper Lake during the winter months are Long-billed Dowitcher, Black-necked Stilt, both Lesser and Greater Yellowlegs, Black Vulture and Turkey Vulture. Also keep an eye out for Red-shouldered Hawk, Osprey, Bald Eagle and maybe even Crested Caracara. Myakka River State Park. Click the photo about to see a video of Black Vultures. Note the park is open at 8:00 AM until sunset and requires a fee of $6 per vehicle. There are very nice cabins you can rent with a full kitchen, bath, fireplace and two beds. I stayed in one of these cabins several years ago and is a great way to spend time in the park. Plus there are several camp grounds, picnic areas, a gift shop with a snack bar (try the gator stew if you go) and ice cream. Great hiking and biking trails and you can rent a bike or canoe and take a ride on the largest air boat in North America. Botton line is you will not lack for things to do and see at Myakka RSP, so if you find yourself near Sarasota make sure you put it on your list of places to visit. Remember please help protect wildlife and wild place.